to be on a U.S Postage Stamp! The U.S. Postal Service accepts nominations for subjects of postage stamps, but it must be done at least 3 years in advance. In 2009, Bobby Darin's #1 rendition of "Mack the Knife" was 50 years old. It hit the charts in 1959 and stayed at the Number One position for 9 weeks, earning Bobby two Grammy awards, Record of the Year and Best New Artist of the Year. 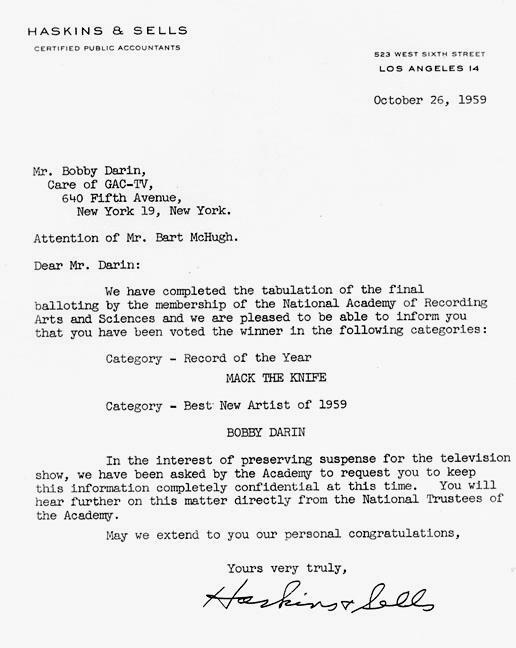 And so, to commemorate the 50th Anniversary of "Mack the Knife" and to continue celebrating Bobby being awarded the GRAMMY'S 2010 LIFETIME ACHIEVEMENT AWARD, lets help him by writing letters to nominate him for his own postage stamp! If you would like to write a letter on behalf of Bobby Darin becoming the subject of a U.S. postage stamp, you can read more information about the process here. Bobby Darin was an all-around entertainer, being a talented singer, songwriter, actor, publisher, dancer and more. Bobby Darin's rendition of "Mack the Knife" stayed in the #1 position for 9 weeks in 1959 and is arguably the signature rendition of the song. He was an American rags-to-riches success. He sang and composed music in virtually every musical genre. He was and is to this day respected by his fans and peers, and even 36 years after his death, his songs remain well-loved and admired. And, most importantly, on January 31, 2010 Bobby Darin was acknowledged by the GRAMMYS with a well deserved Lifetime Achievement Award. For other ideas on what to include in your letter about Bobby's achievements, click here or explore the Bobby and Career sections of the BobbyDarin.net/.com website.